International Temperature Control’s rock solid “S20” series of temperature control modules provides user with an unprecedented level of dependability and ease of operation in even the harshest manufacturing environments. The field proven design and circuitry of our “S20” series of modules produce an instrument that is versatile, productive and cost effective. During start up the advanced “Soft Start” circuitry slowly raises mold temperature in a manner which will protect heaters and safely dry out the mold. After the initial start up function, power to the heaters is increased until the setpoint is reached. A multifunction digital readout displays actual temperature, while the center LED indicates power output to the mold. LED indicators are also provided for high temperature, low temperature, blown fuse, open thermocouple and reversed thermocouple alarm situations. The S20-D3C modules are designed to be used with all of our standard TC-2000, 15 amp and 30 amp main frames or our exclusive panel racks designed for custom applications. International Temperature Control’s rock solid “S20” series of temperature control modules provides users an unprecedented level of dependability, features and ease of operation. All this is a package which is the “Value Leader” of hot runner mold temperature controllers. The S20-D3C unit utilizes microprocessor based circuitry with advanced PID control algorithm. It has also been designed to function with any of our 15 amp or high power 30 amp main frames. The S20-D3C is equipped with an easy to understand and use pin wheel setpoint and digital “LED” readout which displays process temperature and error codes. The module is also equipped with several easy to read individual “LED’s which indicate current operating functions. The S20-D3C module can be used as a fully automatic closed loop instrument, or as a manual power controller. Where additional diagnostics are warranted, the S20-D3C module is a logical choice by providing heater amperage display by the simple push of a button. Automatic Operation – A fully automatic instrument in which only the desired temperature needs to be entered. Manual Mode – May be operated as a manual instrument in thermocouple feedback is lost. 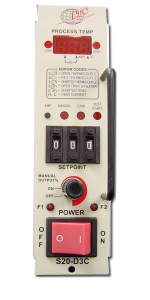 Simplicity of Operation – In auto mode, just set the desired temperature on the pin wheel setpoint and turn on the power. Soft Start – Automatically controls the heating of a cold mold to efficiently bake out moisture before full power is applied. High & Low Temperature Alarms – If the process temperature exceeds the over or under temperature threshold the appropriate LED will display. Type “J” or “K” Thermocouple – The S20-D3C module will operate with either thermocouple by simply changing the thermocouple dip switch. “F” or “C” Temperature Ranges – The S20-D3C module will operate in either temperature range by changing the temperature dip switch. Open Triac/Heater – Error message in the display window. Shorted Triac – Error Message in the display window. Over Current – If the module detects current draw in excess of 16 amps, an error message will display.